WHILE NO comprehensive history of Christianity in India has yet been produced, the Church History Association of India (CIamp;mdash;LAI), located in Bangalore, has produced several excellent volumes. Of note: History of Christianity in India, Volume I: From the Beginning up to the Middle of the Sixteenth Century (1982) and Sixteenth century traditions of St. Thomas Christians (1970), both by Mathias Mundadan, one of India’s most distinguished church historians; History of Christianity in India, Volume IV, Part 2: Tamilnadu in the Nineteenth and Twentieth Centunes, by Hugald Grafe (1990); and History of Christianity in India, Vol. 5: North East India in the Nineteenth and Twentieth Centuries (1992), both by Frederick S. Downs. 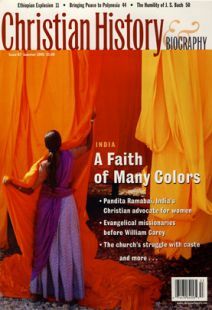 CHAT also publishes the Indian Church History Review. The best existing general study is Stephen Neill’s masterful two-volume History of Christianity in India(Cambridge, 1984, 1985). Neill himself spent 20 years as a missionary in southern India, becoming bishop of Tirunelveli in Tamil Nadu, and few historians of Christian mission have as much stature as he does. Neill also wrote a shorter one-volume overview, The Story of the Christian Church in India and Pakistan (Eerdmans, 1970). Other general studies include A History of Christianity in Asia, by Samuel Hugh Moffatt (Orbis, 2005). Robert Eric Frykenberg is currently engaged in writing the Oxford History of Christianity in India, which will attempt to tell the whole story from an Indo-centric perspective, with special emphasis upon Christian peoples within Hindu and Muslim contexts, rather than ecclesiastical structures. In the meantime, if this issue piques your interest in Indian Christianity but you’re not sure you want to dive into a book on the subject, check out Frykenberg’s chapter on India in Adrian Hastings’s A World History of Christianity (Eerdmans, 1999). In less than 50 pages, Frykenberg introduces the traditions surrounding the Apostle Thomas, then traces the development of Thomas, Catholic, and evangelical Christianity down to the present time. Another brief survey is Kenneth and Helen Balihatchet’s entry on “Asia” in The Oxford Illustrated History of Christianity, edited by John McManners (1990). Several volumes in the Studies in the History of Christian Missions series published by Eerdmans focus specifically on Indian Christianity: Protestant Origins in India: Tamil Evangelical Christianity, 1706—1835, by D. Dennis Hudson (2000); In the Shadow of the Mahatma: Bishop V .S. Azariah and the Travails of Christianity in British India, by Susan Billington Harper (2000); Christians, Cultural Interactions, and India’s Religious Traditions, edited by Judith Brown and Robert Eric Frykenberg (2002), and Christians and Missionaries in India, edited by Frykenberg (2003). Here are some more titles for further study. Ancient Christianity in India:The Indian Christians of St. Thomas, by Leslie W. Brown (Cambridge, 1956; reprint 1982). Ziegenbalg and the Tranquebar Mission: It Began in Tranquebar, by E. Arno Lehmann (CLS, 1956);and The First Protestant Missionary to India: Bartholomacus Ziegenbalg, 1683–1 719, byBrijraj Singh (Oxford, 1999). Catholicism:A history of Christianity in India, from early times to St. Francis Xavier: A.D. 521542, by George Mark Moraes (Bombay: Manaktalas, 1964); A Pearl to India: The Life of Roberto di Nobili, by Vincent Cronin (Dutton, 1959); and Catholic Revival in India in the 19th Century: Role of Mgr. Clement Bonnard (1796–1861), by Thomas Anchukandam (Bangalore: Kristu Jyoti, 1996). Pandita Ramabai: Pandita Ramabai’s America, edited by Robert Eric Frykenberg (Eerdmans, 2003); Pandita Ramabai:Through Her Own Words, by Meera Kosambi (Oxford, 2000); and Pandita Ramabai Saraswati, by Padmini Sengupta (Asia Publishing House, 1970). South India: Christians and Public Life in Colonial South India, 1863–1937, by Chandra Mallampalli (Routledge! Curzon, 2004). Northeast India: The Growth of Baptist Churches in Nagaland, Puthuvail Thomas Philip (CLC, 1976; 2nd ed. 1983). The Mighty Works of God: A Brief History of the Council of Baptist Churches in North East India: The Mission Period, 1836 – 1950 (CLC, 1971) by Frederick S. Downs. Others: Resistant Hinduism: Sanskrit Sources on anti-Christian Apologetics in Early Nineteenth Century India (Vienna & Delhi, 1981) and The Bible Trembled: The Hindu-Christian Controversies of Nineteenth Century Ceylon (De Nobili Research Library Vienna, 1995) by Richard Fox Young; A History of Dalit Christians in India, by John C. B. Webster (Mellen, 1992); and In Search of Identity: Debates on Religious Conversion India, Sebastian C. H. Kim (Oxford, 2003). Studying about another culture is one thing; going there and seeing it for yourself is quite another. If you’re not up to the 20-hour trip to New Delhi, the next best option is Charlie Pye-Smith’s travelogue, Rebels and Outcasts: A Journey Through Christian India (Viking, 1997). Weaving together historical background with first-hand descriptions of contemporary Christian communities, Pye-Smith’s evocative account will bring the colors of India to your reading chair. C.S. Lewis: Did You Know?